In a British/USA joint operation, a drone has a group of high value terrorists, most of which are USA and British nationals, in sight. Initially a capture mission, when suicide vests are being prepared for use by the terrorists inside of a house in an Al-Shabaab controlled neighborhood in Kenya, the mission is switched to a kill strike. However, there is a danger of civilian collateral damage namely a little girl selling bread directly outside the targeted house. Those in charge of the mission debate the morality of continuing with the strike verses waiting to hash out what each option could mean. Who knew the process of buying bread could be so extreme? 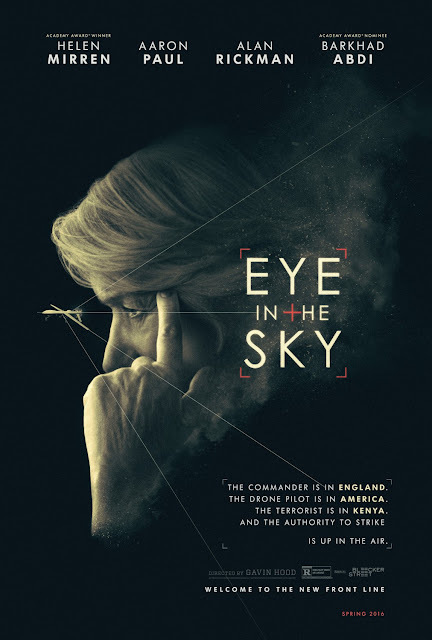 Director Gavin Hood's "Eye in the Sky" is an edge-of-your-seat political and military thriller dealing with a lot of moral, political, and ethical issues concerning modern wartime. It stars the continually wonderful Helen Mirren as Colonel Katherine Powell, the commanding officer in charge of a joint operation tracking United States and British nationals who have become terrorists and are on the East African most wanted list. Joining Mirren is our favorite, gone too soon, the remarkable Alan Rickman as Lt. General Frank Benson, who is overseeing the operation and acts as the liaison between the military and British elected officials, Aaron Paul as drone pilot Steve Watts, Phoebe Fox as drone camera operator Carrie Gershon, and Barkhad Abdi as their covert man on the ground named Jama Farah. This is a intense movie that offers a nail-biting scenario. It looks at the morality of war dead in the eye, something that can get lost in gunshots, battlefields and bad versus good. It shows how politics can impact those decisions and how international law plays a large part in the military action we take, even when dealing with terrorists. People in the same position may see the question they are presented as a no-brainer: if terrorists are gathering, it is the duty of the military to unequivocally take them out. This is a lot easier to say when you're not the one who has to pull the trigger. Powell meets the most resistance from a politician named Angela Northman, played by Monica Dolan, who believes it would be better in the public eye if the blood of an innocent life was found on the hands of the terrorists rather than on their own. Northman is of the mindset that one innocent life is more important than the immediate prevention of a possible terrorist attack that may or may not result in civilian casualties at a later date. As an audience, we are essentially presented arguments on both sides of the spectrum from a political, legal, moral, and ethical standpoint. Does one innocent life mean more than another, and how much is one innocent life worth? In the end, we are glad we aren't the ones making these tough calls. Even if the proper call is made, those tasked with dropping bombs and killing people, innocent or otherwise, will have to live with the aftermath where neither outcome is ideal. Helen Mirren is simply fantastic in this movie. Her character has the military mindset that sometimes necessary evils must be done for the greater good. We completely believe Mirren in this part. Her presence is commanding, her gaze and directions strong, and she never lets emotion get the best of her, even in an incredibly emotional situation. Powell must either find a way to take out the terrorists she has been tracking for 6 years with minimal civilian casualties, or potentially risk having their suicide vests and bombs detonated in unknown, populated urban areas. It is interesting to note this role was originally written for a man, but the part was changed for a woman. 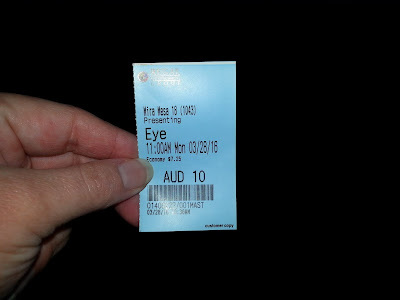 Personally, we think this change sets "Eye in the Sky" apart from the scores of other male-dominated war thrillers. It shows a woman in a high ranking position of power making the tough calls that could potentially end in casualties, something we are not shown very frequently in cinema. Alan Rickman was truly one of the best actors of his time. Ready to get the hard job done, his character Lt. General Frank Benson is a career military man who has clearly seen it all. When questioned with the ethical, moral, and political implications, he weighs the decision heavily, making sure to go through the proper channels each step of the frustrating way to ensure maximum effort is made to make the right call. Aaron Paul plays the drone pilot tasked with pushing the button to unleash a hellfire missile on a house full of terrorists in a friendly nation, and Phoebe Fox is the drone camera operator. Unlike Mirren and Rickman, Paul and Fox's faces tell an entirely different story. Pained by what they could be forced to do from a desert thousands of miles away, the two project the other side of the coin, the sadness that comes from possibly killing one innocent girl. The juxtaposition is not lost on us. It's good to see Barkhad Abdi getting more work after his marvelous performance in "Captain Phillips," and he's good in his limited role here. "Eye in the Sky" is tense and intense. Each scenes feels a bit more suffocating as seconds click by and potential lives are at stake. Though it is jargon heavy, this never distracted us from the gripping thriller presented in front of us. There are some awful CGI images of drones and other animal-shaped cameras here, which is one of the film's downfalls, but again, it's not enough to detract from the issues and debates at hand. Powerful doesn't begin to describe this movie. As modern times simplify warfare, now, instead of an atomic bomb being dropped in one fell swoop, the simple push of a button now means the eyes in the sky are watching, waiting to do the difficult task of stopping terrorism worldwide as those in charge make calls and watch from hotel rooms, secluded buildings, and desert bunkers. We remained completely engaged throughout its run time and couldn't help but be wrought with the pain of this dilemma long after the credits had finished running. One year ago, we were watching: "The Fast and the Furious: Tokyo Drift"